Plucked from foster care, Mary Richards hit the jackpot with a loving family, an apartment on the Upper East Side of Manhattan and a spot in the elite Purser-Lilley Academy. But she might lose it all if people find out about the turning. Something not human is inside Mary. Her mind is reeling and her body is rebelling. She succumbs to urges and desires she never imagined. And then there’s the bizarre physical transformation. Struggling with her metamorphosis, Mary is sought out by two boys who share her secret. Will she reject the destiny they swear is hers? 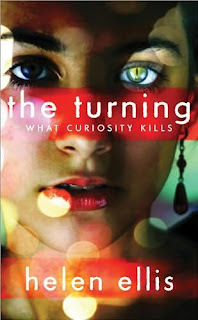 Or will she find our what curiosity kills? You only get one chance to decide if you’ll never turn again. When I received this book, I was in a hurry to read it! The cover, in my opinion, is amazing with one cat eye on the girl. According to the synopsis it was going to be a paranormal book about changing into cats. So it was something different than the normal paranormal of werewolves and vampires. I so desperately wanted to love this book. To tell you the truth though, the cover was about the only thing I liked about it. I had to force myself to even finish the book. There was too much detailing and not enough dialogue. It didn’t flow easy and the story was all over the place at times. The characters had no appeal to me as I read through the book. There seemed to be alot of product pushing in the book as to what all the characters were wearing each time we read about them, the characters were dull instead of having life on a page. While the idea for the book would have been great, it just didn’t come across as a great book. I am still on the fence about wanting to read the next book in the series for now. If the author can rework some of the bad points, then I might be interested in the next one just to see if it does turn out better. I did not enjoy this book! those were some of my same thoughts too but my review is coming too. Thanks for sharing an honest review. Sounds like an interesting idea but as you mentioned my pet hate (clothes descriptions) I don’t think I’ll be bothering with this one. I just finished this one. I didn’t love it, but I enjoyed it.